An easy-to-make drop cookie with a bright lemon flavor. 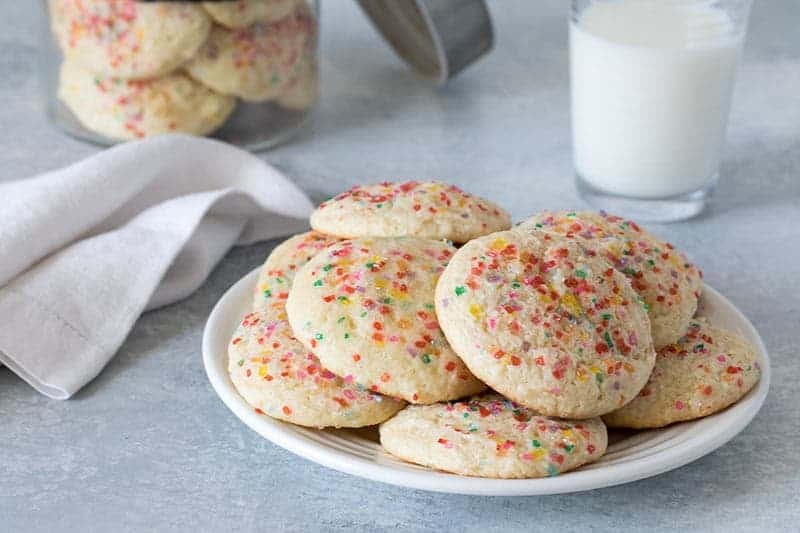 These Lemon Sour Cream Drop Cookies are a tender, cakey, not-too-sweet cookie topped with colorful sprinkles that kids and adults will both love. Last month I posted my Fudgy Chocolate Sixlets Cookies in honor of Cookies for Kids’ Cancer. Bloggers and these three companies: Dixie Crystals, Mediavine and OXO help to raise over $13,000 for children’s cancer research. As a thank to the bloggers who participated, we we’re sent a package of fun things to help us get baking, including two cookbooks. This recipe is slightly adapted from a recipe in the cookbook, Cookies for Kids’ Cancer: All the Good Cookies. Whenever my grandson visits he loves to bake with me. This time I let him pick a cookie to bake from the new cookbooks. He chose the colorful sprinkle cookies on the front cover. I changed up the recipe a little bit to suit the way I like to bake. I prefer to mix the flour with the leavening ingredients and salt before creaming the sugar and butter so that it’s ready to use. To boost the lemon flavor in the cookies, I added some lemon emulsion in addition to the lemon zest originally in the cookie recipe. My grandson also loves going into my studio and helping me take pictures of whatever we’ve baked. He loves rearranging the the set up, and was more than happy to be the hand model for my picture. The cute little jar in the picture was a gift from my sweet friend Carol. It has a fun, erasable chalkboard label that you can change up however you’d like. Carol’s also the one who introduced me to the lemon emulsion I added to the cookies. If you haven’t tried emulsions yet, it really is a great flavorer booster. 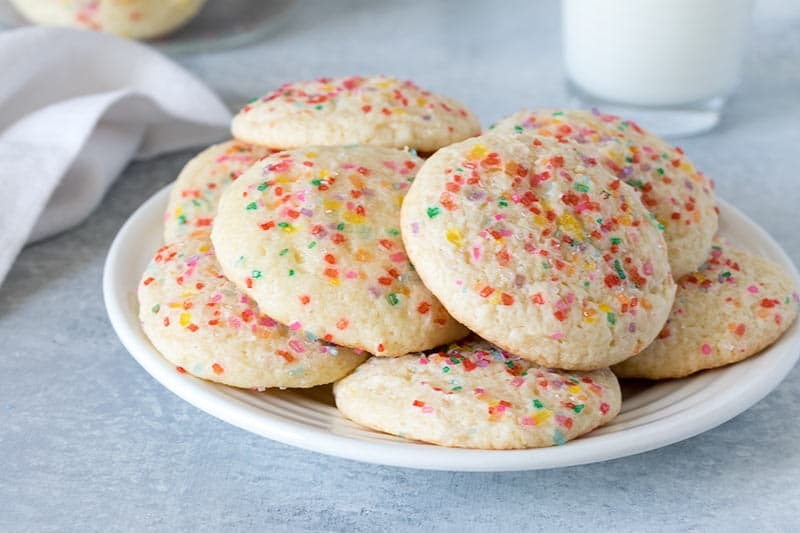 Another change I made was to use Rainbow Sparkling Sugars to top my cookies. I like the sparkling sugars because they don’t bleed and stay bright and colorful. 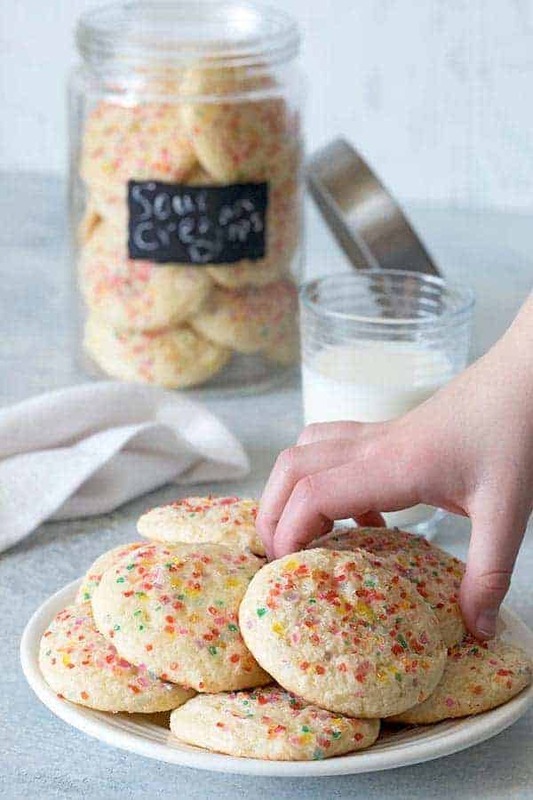 The original recipe is pictured with Rainbow Nonpareils which is a good option as well. If you like a cakey cookie, definitely give these fun Lemon Sour Cream Drop Cookies a try. Preheat the oven to 350°. 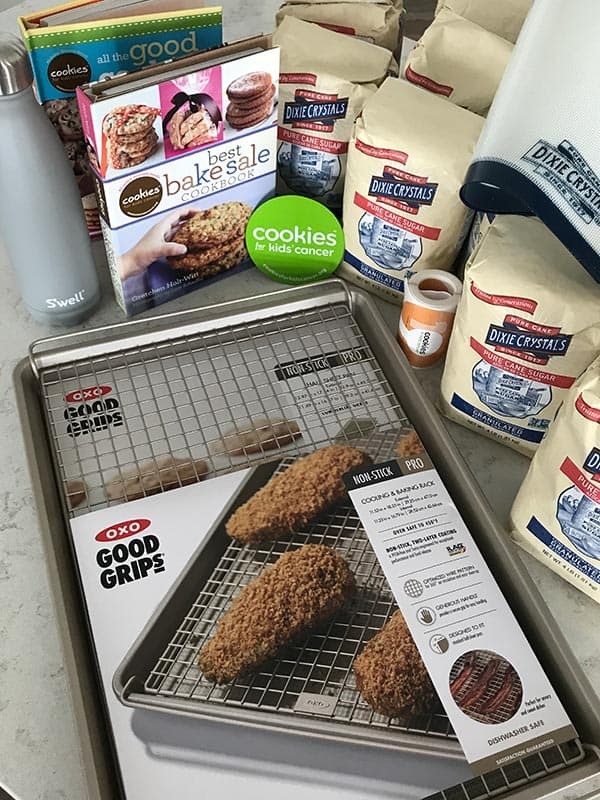 Line 2 cookies sheets with Silpats or parchment paper. In a large mixing bowl, beat butter and sugar until smooth and creamy, about 3 minutes. Add eggs, vanilla, lemon emulsion (if using), and lemon zest. Mix until well blended. With the mixer on low speed, add one-third of the flour mixture to the butter mixture. Add half the sour cream. Add another third of the flour mixture. Add remaining sour cream and remaining flour mixture and mix until blended. Use a cookie scoop (I use a 1 tablespoon scoop - put the recipe suggestions a 2 teaspoon scoop) to drop the dough about 2 inches apart on the prepared cookie sheets. Top with sprinkles. Bake until the edged of the cookies are lightly browned about 11 - 13 minutes. Cool on the cookie sheets for 3 minutes. Transfer to wire racks to cool completely. Store in an airtight container for up to 3 days, or freeze for up to 3 months. Thank you so much for participating in the C4KC fundraiser last month! We hope you got your Mediavine spatula in addition to all the other awesome swag. I did – thanks Jenny! The spatula came a few days after I snapped the picture. Is lemon emulsion the same as lemon flavor? Ohhhh those look so good! I just love lemon-and those cookies shout SPRING with all those pretty colors on top. Aren’t those emulsions the best? I use them all the time. What a great helper you have-the perfect hand model….and taste tester too? 🙂 Those cookies look WAYYY too hard to resist. I’ve been contemplating what to make for dessert when the family comes for Corned Beef and Cabbage….a plate of these just might be the ticket (beside the Italian Ricotta Cheesecake from the pressure cooker that is!). I have all the ingredients on hand too….perfect!!! Can’t wait to try them.